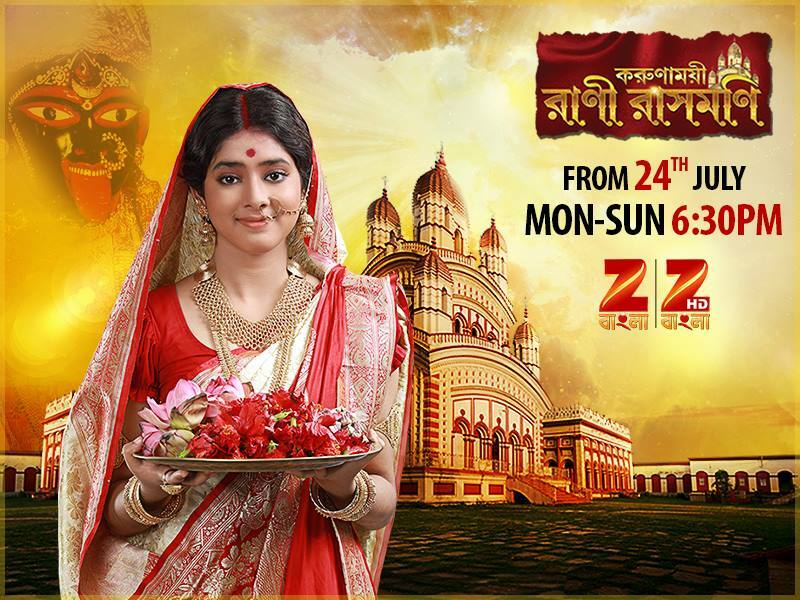 'Karunamoyee Rani Rashmoni' is an upcoming serial on Zee Bangla. The show is Produced by Subrata Roy Production .The show will replace Ei Chheleta Bhelbheleta. Rani Rashmoni is a historical figure. She was the founder of the Dakshineswar Kali Temple of Kolkata. She was closely associated with Sri Ramakrishna Paramhansa. Her rebellion against the British Raj to ensure a better life for her subjects is epic to say the least. Rani Rashmoni blocked the shipping trade on a part of Ganges compelling the British to abolish the tax imposed on fishing in the river, which threatened the livelihood of poor fishermen. There are innumerable stories of her bravery which will be revealed as the story progresses. Rani Rashmoni, being very pious from childhood, continued to lead an extremely religious and austere life, befitting a Bengali Hindu widow. A divine revelation led her to found the famous Dakshineswar Kali Temple on the banks of the Ganges. Sri Ramakrishna Paramhansa was appointed its head priest under her patronage. Rani Rashmoni is a leader who lived for her subjects and a woman, who set an example amidst a male-dominated society. Karunamoyee Rani Rashmoni is one of a kind fiction show that will majestically present the life story of Rani Rashmoni who is revered all over Bengal even 150 years after her death. This is a story that the audiences will not want to miss. who acted in Bengali films like Rajkahini and Abosheshey.